The August Smart Lock is a home security device that seeks to revolutionize the way we protect our homes, and in turn, ourselves. 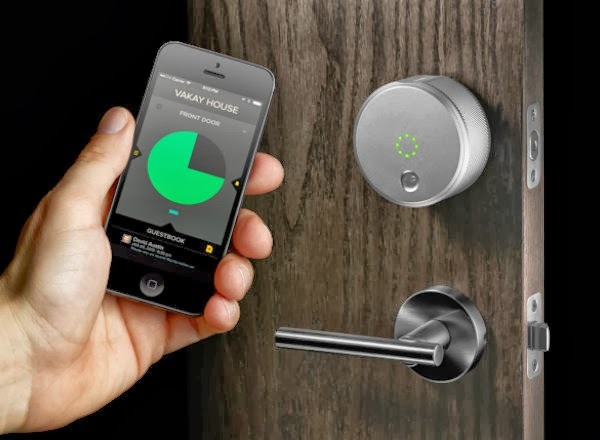 Recently, at CES 2015, August announced their latest smart lock accessory, the August Connect. The name ‘Connect’ refers to the device’s identifying feature: its ability to connect to WIFI. But why is this feature so exciting? A WIFI-connected security device enables users to control the lock remotely. So if a friend needs to get into your home while you’re out, you can unlock the front door with your smartphone. Or if an unexpected visitor enters, you’ll be notified immediately. The August Smart Lock can be found on August.com for $249.99. The Connect accessory will be available in February for $49.99.